This campaign marked an industry-first; utilising VR technology to showcase the airline’s newly refurbished A330’s via 360º video. We invited the audience to explore the action and clues onboard to identify where the flight was headed in each video. space featured aircraft and cabin crew. There was a significant appetite for aviation content and social engagement was high for video content relating to ‘plane unboxing’, cabin tours and staff interviews. This was also the type of content that would cement the brand as an airline, not a package holiday provider. Based on the research, we wanted to develop a concept that allowed users to explore the new fleet in an interesting and unexpected way. It was also important to prove that with Thomas Cook Airlines, your holiday start on the plane, not when you arrive at your destination. We leveraged cutting edge Virtual Reality technology to create a fun and immersive experience. #TCAFantasyFlight is a ‘try before you buy’ concept that uses VR technology to showcase the newly refurbished fleet and cabin crew in a 360° video - an industry first. These weren’t ordinary flights. The three videos were set in the flight deck, premium class and economy and featured real pilots and crew going about their normal duties while the cabin came to life with colourful characters connected to 3 new routes launching in 2016. Passengers on the Fantasy Flight included celebrity lookalikes, sportsmen, historic figures, paparazzi, tourists, students and musicians. Using YouTube’s native technology, the audience were directed to a bespoke microsite, design and built specifically for the campaign. If the user explored the videos thoroughly, the characters could be used as clues to help them guess and win a holiday to Los Angeles. A social media toolkit and calendar of promotional content for Facebook, Twitter and Instagram was created to enable the client to roll out the campaign easily. Content was used to generate conversation and drive users to engage with the competition. Utilising tailored content for each social platform including; short form videos for Facebook, Boomerang content on Instagram and animated gifs on Twitter. Each previewing and teasing the Fantasy Flight passengers. Facebook advertising was used to generate traffic to the campaign microsite and amplify campaign content to new audiences. 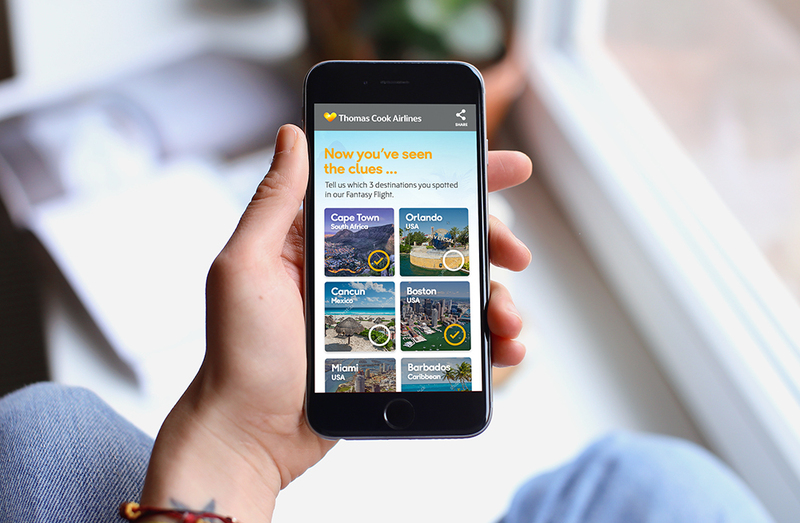 The platforms targeting options meant we could test promoting the campaign to a wide range of users, including competitor audiences and those in Thomas Cook Airlines’s target regions. YouTube advertising was also used to promote the videos via pre-roll and display advertising. Clever targeting relating to VR technology enabled us to get the CPV for this activity to below 0.01p. #TCAFantasyFlight generated the strongest social media results in the brand’s history; delivering over half a million video views on YouTube and providing a significant increase in both engagement and social following. In addition, the campaign garnered fantastic coverage from both trade and advertising press.